“Through the Eyes of Artists” poster featuring South Gate by Artist Ja’Rie Gray. Continue celebrating National Arts and Humanities month by riding Metro and discovering the next poster in our “Through the Eyes of Artists” series featuring South Gate. 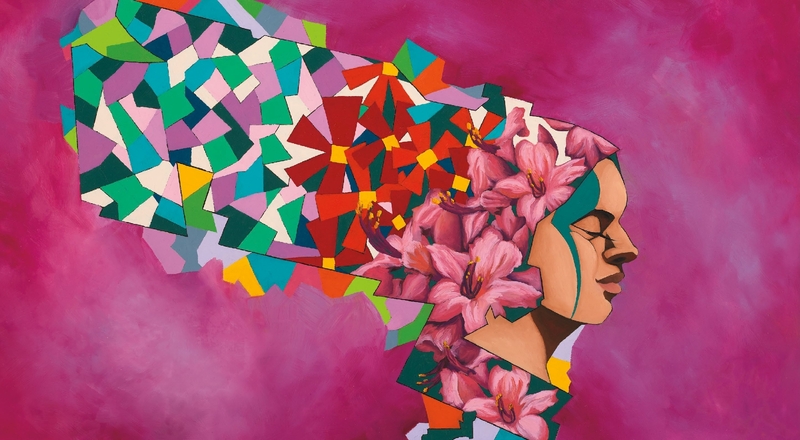 Artist Ja’Rie Gray depicts a radiant headdress of azaleas symbolizing South Gate’s civic pride. A representation of femininity and the official flower of this family-friendly community, the ruddy flower petals gradually evolve into abstract building blocks that take the shape of the city’s boundaries. Meet Gray and receive a free, signed copy of her poster during South Gate’s Azalea Festival. This event is free and open to the public. 2:30 p.m to 4:30 p.m. In the tradition of celebrating transportation through colorful travel destination posters, Metro commissions a diverse range of Los Angeles artists to create original artworks for the Through the Eyes of Artists poster series. Established in 2003, the posters are displayed on board Metro trains and buses; South Gate is 44th in the series. Other posters to be released this year include Altadena, East Hollywood, Studio City and Torrance.